Every week, Vulture runs through the best, most interesting, and sometimes most confusing rap releases. In this installment: punishing experimental rap from Curly Castro, magnetic autobiographical tracks from Rucci, a low-key tape from Mozzy and CashLord Mess, blunt street rales from Buffalo-based Conway, and more. Unless I’m forgetting someone obvious, there’s no vocalist in rap who is able to seem as intense as Rucci without ever seeming to swear. For My Dawgz is billed as a stopgap project — it’s loaded with guests and does not feature the local hits he’s posted to Soundcloud since this year’s excellent El Perro — but that intensity, and Rucci’s streak as a shocking, no-frills autobiographer, make the record another magnetic listen. The Inglewood native teams up with fellow burgeoning L.A. rappers like AzChike, AzSwaye, 1TakeJay, and 1TakeQuan, and, once again, it’s that push-and-pull between Rucci’s voice and those of the others that gives these songs their dynamics. The production is lean and serrated. It’s for cars. It is becoming redundant to describe Chris Crack’s gifts: he’s a unique writer who can be bitingly funny and unnervingly real, sometimes within the space of two bars; he conjures a Chicago that is neither the hellscape depicted by the GOP nor a pastel-colored version in which all the corners are safe. Barely a month after his crackling Just Gimme a Minute, he returns with Thanks Uncle Trill, where the songs have more heft and are interspersed with predictably hilarious voicemails from underground mainstay J-Zone. Crack’s 2018 doesn’t have a clear precedent. He flooded his fanbase with four solo projects, but the feel of the records themselves is unlike the saturation models of, say, Lil B ca. 2010 or Gucci Mane a few years earlier, where the sheer bulk of material was the point. Uncle Trill, like its predecessors, has a clear shape to it, and is refreshingly self-contained. All the music that has unfurled from Buffalo and onto Discogs this year has been captivating, but of all the Griselda members, Conway is the one whose best work reaches a level of mercenary greatness that needs no mythology to buoy it. A sequel to his excellent album from earlier this year, Everybody Is F.O.O.D. 2: Eat What You Kill, can be difficult to find on the internet, but is not coy once you hit play on the first track: It is furious and unsparing, and even its moments of introspection (“Cocaine Paid”) are void of sentimentality. Dying To Live is, at a bare minimum, the best Kodak Black record of the last few years aside from Painting Pictures — it pays off the promise he’s shown since his breakthrough, Project Baby, with its marriage of razor-toothed rap verses and pained, sung tangents, and several of its songs, especially its bookends, reveal an emotional depth that would be impressive from any songwriter, much less a 21-year-old. That latter element is, of course, almost impossible to reconcile with the particularly brutal crimes of which he’s accused and for which he’ll stand trial next year. The first sentence of the Editors’ Notes on this album’s Apple Music page mentions Gucci Mane’s abs. The banner picture at the top of the screen shows him leaned back — shirtless — with a fur draped over his shoulders, gaudy sunglasses, a finger playfully to his lips, everything pure, expensive white. 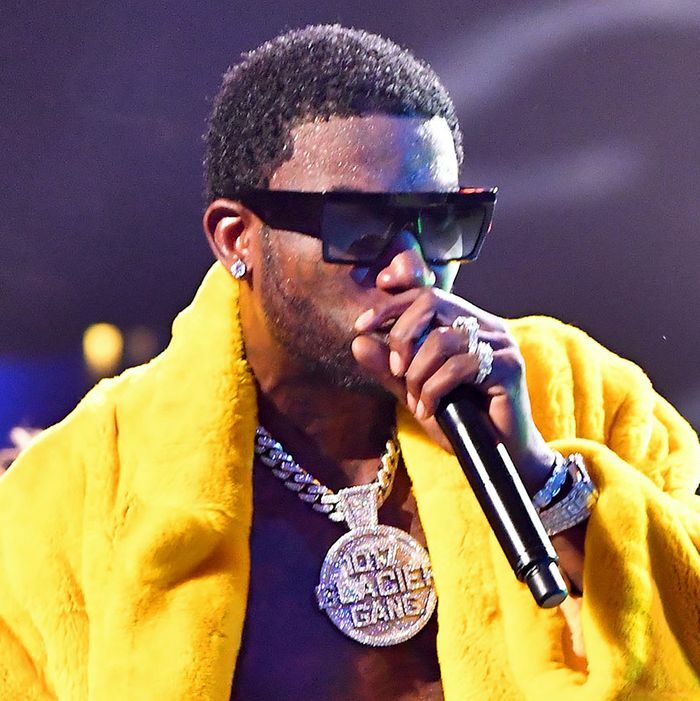 Gucci as aspirational lifestyle brand has yielded mixed results in the booth, but this new context underscores what has always been true about his work: it’s a series of writing exercises, little language games that use rap tropes and Gucci’s self-built mythology as component parts in endless new arrangements. See the hook of “Outta Proportion,” then look back up at that banner pic.